IT Sligo have been reinstated to the Sigerson Cup after they successfully appealed against being thrown out of the competition. Martin McHugh's Sligo side had been found to have fielded an ineligible player in their 1-9 to 0-8 first-round win over Queen's. The Belfast side were also expelled from the competition after being found to have committed a similar breach. IT Sligo will now face UCC in a quarter-final in Cork on Friday. The GAA's Central Appeals Committee (CAC) overruled the GAA's Higher Education Committee's initial judgement that Sligo have been wrong to field the college's Student's Union President Stephen Doak. IT Sligo successfully appealed the ruling, as while the rule not allowing sabbatical officers to play had been included in the rulebook in the past, it had been omitted from the current constitution. Tuesday's Central Appeals Committee hearing also decided that the Queen's should be allowed to field Stranmillis College players in future competitions. Stranmillis College students Ciaran O'Hanlon, Tony Donnelly and Greg McCabe had all featured in the extra-time loss to IT Sligo which led to Queen's also being thrown out of the competition. There had been some doubts over the eligibility of the teacher training college students to play for QUB, despite holding the relevant Queen's University student cards, as a GAA Club has been established Stranmillis in the past two years. Responding to Tuesday's ruling, Queen's welcomed the decision to uphold their appeal on the eligibility of the three players. "The decision reaffirms the 2012 ruling by CAC which had deemed Stranmillis students eligible to play for the University," added a Queen's statement. "It is important to note that, contrary to some reports, this ruling does not have widespread implications in our sector, as it is the exact same decision that was handed down by CAC three years ago. "Even then, it was made clear that the ruling only related to this unique case. The relevant rule has existed for over 10 years and has served the sector well. "Queen's had lodged an objection to the participation of the IT Sligo Student's Union President on the grounds that in 2011, the Higher Education GAA sector had decided to remove the rule allowing a sabbatical officer to play and that was clearly on the unanimous agreement that sabbatical officers were no longer eligible to play. "Our motivation behind these actions was not to halt the competition and regain our place. "As well as seeking out a means of dealing with the case of the Stranmillis players, we primarily felt that we needed to take a stand on eligibility issues that exist within our sector. 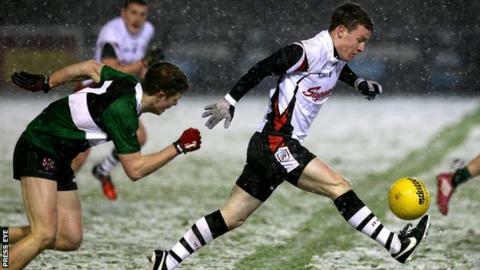 "We believe the Sigerson Cup to be a great competition and we want it to thrive. "Radical change is not required - Comhairle Ardoideachais simply need to address the issues that exist and to ensure that everyone plays by the same rules." The statement concluded by extending best wishes to all the remaining team's in this year's competition and the finals weekend hosts UCC. Meanwhile, Ulster's remaining Sigerson Cup hopefuls St Mary's College face DCU in the quarter-finals at their home ground of St Genevieve's in Belfast on Wednesday (14:00 GMT).